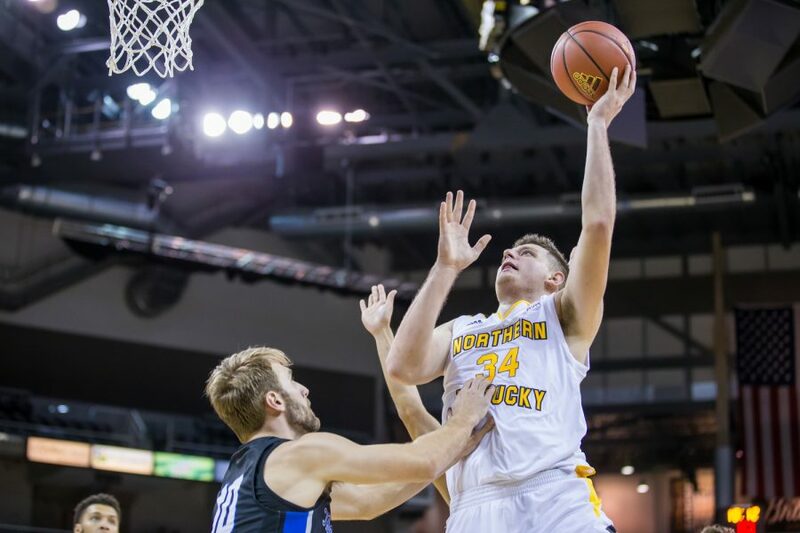 It only took 6,506 days, but Craig Conley now has company in NKU’s triple-double club, as Drew McDonald became the long-awaited second member on Tuesday night. The Cold Spring, Kentucky native recorded 12 points, 14 rebounds and a career-high 11 assists to help the Norse (7-1) cruise past Morehead State (2-5) 93-71. The Norse held an early 14-10 lead at the 14:16 mark of the opening half, but the Eagles used a 9-0 run two minutes later to get themselves back in the game and move ahead 19-14. After being held four minutes and six seconds without a field goal, the Norse went on an 11-0 run to turn the tide and head into the lockeroom at halftime ahead 46-38. McDonald posted 10 points, 11 rebounds and seven assists in the first half, while Dantez Walton netted 12 points and three rebounds. The Norse also shot 58.1(18-of-31) percent from the floor and 46.2 (6-of-13) percent from beyond the arc going into the break. In the second half, Tyler Sharpe scored 19 of his career-high 28 points to catapult the Norse to victory. Sharpe went 5-of-8 from beyond the arc and 8-of-14 from the field, while Zaynah Robinson added 20 points, five rebounds and four assists. It was the first time since Dec. 19, 2017 that the Norse had two players score more than 20 points. Ironically enough, it would be against the University of Maryland-Baltimore County, their next opponent. Walton tallied 15 points on 6-of-10 shooting, including 3-of-6 from beyond the arc. He also snagged five rebounds and two assists. The Norse finished 37-of-59 (62.7 percent) from the field and held the Eagles to just 21-of-58 (36.2 percent) shooting from the floor. The Norse also held the advantage in the paint (42-18) and outrebounded the Eagles (40-27). The Norse will be back in action on Friday, Nov. 30 as they play host to last season’s NCAA Tournament bracket buster, UMBC. The Retrievers made headlines last year when they became the first no. 16 seed to upset a no. 1 seed (Virginia) in the NCAA Tournament. Tipoff is scheduled for 7:00 p.m. and will be broadcasted on ESPN+.